This series strives to profile each cat once—and, occasionally, uncertainty looms about one being the same as another. Take Hanoi (his real name), whose color and markings are similiar to the kitty I call Bell. There would be little doubt, if not for fairly close proximity of their sightings. Bell debuted on Nov. 17, 2016, from a photo captured on June 28, 2014. 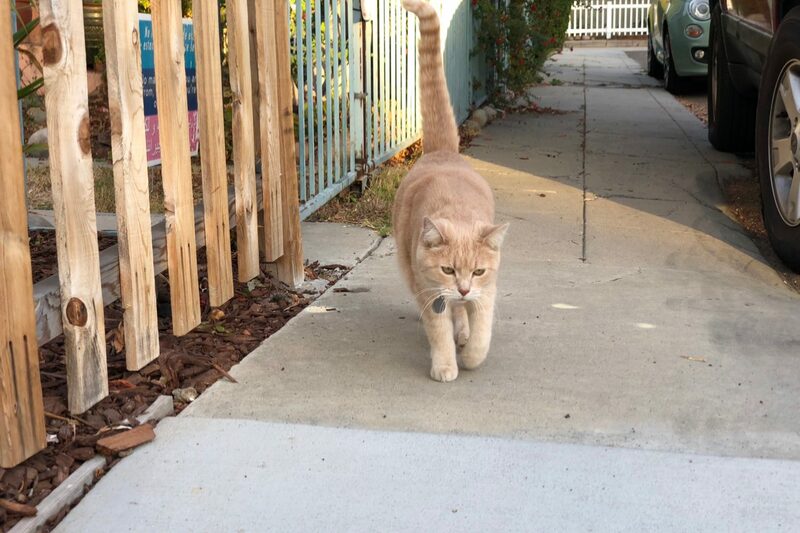 I often would see the kitty in the alley behind our apartment alongside Kuma’s Ledge, where Maryland Court ends. The three year-old portrait was shot at the corner of Cleveland and Monroe Avenues, however. Is Hanoi really Bell, but fuller from age? I can’t reconcile enough of the markings, shape of ears, or facial dimensions to say they’re a single beastie. Only because of location is there doubt. Perhaps they are the same cat, or I confused one for another—and for years; there was a fairly lengthy gap of many months with no sightings whatsoever. 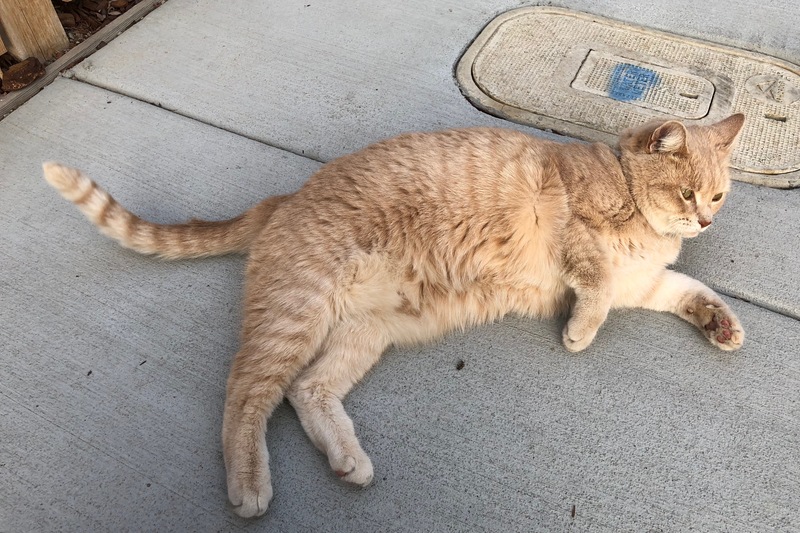 In the decade that we lived in West University Heights, I have never seen an outdoor cat clearly residing along Maryland Court, although our (long-lost) Kuma would go there often. My wife and I encountered Hanoi three days ago, in a yard, at 4:18 p.m. PST—about 30 minutes before sunset. Seeing us, he came through the fence onto the sidewalk to visit. Bell was skittish. Hanoi lives in a dangerous place for a cat. Maryland Court runs perpendicular into Maryland Ave., behind which there is a massive canyon from where coyotes are known to roam and to leave in search of prey. Any small animal living outdoors, and parading about at night, risks being taken. I used iPhone X to shoot the Featured Image, and its companion. Vitals for the first: f/1.8, ISO 20, 1/184 sec, 4mm. For the second: f/2.4, ISO 25, 1/120 sec, 6mm. Don’t miss: Scruffy, Roly Poly, Woo, Skull, Biscuit, The Colonel, White, Chipper, Frisky, Stretch, Needy, Farfisa, Mates, Hunter, Pee-Pee, Blue, Blue Too, Bonded Pair, Patience, Fess, Jumper, Frenemy, Looker, Cozy, Scout, Lurks, Skit, Mini, Betty, Black and White, Stalker, Bell, Chill, Sammy, Scratch, Poser, Star, Grey and White, Watcher, Herman, Comet, Roman, Willow, Chub, Nimbus, Watson, Lilo, Kit, Pepe, Twilight, Sebastian, Spot, Booger, Ash, Veruca, Riley, Mellow, Bonde, Flower, Glass, Black, BeBe, Fang, Bruce, Siamese, Pounce, Tortie, Haiku, Fraidy, Peso, Daniel Tiger, Dusk, Stride, Dainty, Spry, Tabby, Betty Too, Still, Levi, Shadow, Sophie, Wink, Ferals, Momma, Charlie, Tux, Cool, Benny, Jellicle, Itchy Valentino, Goldie, Nine, Amanda, Siesta, ChaCho, Charlie, Too, Mika, Crystal, Seeker, Mittens, Dancer, Smokey, Monkey, Captain Blackbeard, Season, Maven, Tink, Chunk, and Curious.